HAPPY VALENTINE’S DAY! Share Your Love of the Arts All Month Long! BankNewport Family Night is February 6 at 7P – see inside for details! TICKET INFORMATION ALERT – BUYERS BE AWARE! Learn more in our School of Rock story! At the Box Office: 220 Weybosset Street, Providence, RI 02903 Regular Box Office Hours are: M - F, 10A - 5P; Sat, 10A - 2P and two hours prior to curtain time(s) on show dates. Please call to check on-site hours for The VETS Box Office. Visit ppacri.org or thevetsri.com for additional information and to order tickets. Online: ppacri.org • Tickets are available anytime online. Gift cards are available in any denomination when purchasing by phone at (401) 421-ARTS (2787) or at the Box Office window. Only specific denominations are offered online at ppacri.org (i.e. $25, $50, $75, etc.). Once PPAC has announced the on-sale date for HAMILTON, please visit the PPAC Box Office, call (401) 421-ARTS (2787) or visit ppacri.org for more information. This will ensure access to the best seats at the best prices available and will eliminate the risk of counterfeit tickets. Single tickets for our engagement of HAMILTON are not currently on sale, and an on sale date has not yet been announced. Sign up for our email list at ppacri.org in order to be among the first to know when tickets go on sale. PPAC requests that all guests arrive as early as possible and bring minimal personal belongings to the Theatre. Guests entering PPAC are subject to search at the discretion of management, which will include pat down or scan by metal detector. All bags are subject to search; bags that pass inspection must fit comfortably under a guest’s seat. Laptops, briefcases, suitcases, and outside food and beverages are not allowed in the building. Any items confiscated will not be returned. PPAC does not provide an area to check bags, coats, or any personal belongings. Please note that a Providence Police detail is on site at all PPAC events. PPAC management reserves the right to change their security policy or implement any security measures required for any performance without advance notice. Accessibility Services are available through the House Manager’s desk in the Grand Lobby and through the Box Office. Services include assistive listening devices and wheelchair accessible seating. Sign Interpretation, open caption, and/or visual description services are available. For details, please call the Box Office at (401) 421-ARTS (2787). CALLING YOUNG ARTISTS – APPLY NOW TO THE ARTS SCHOLARSHIPS 2019 PROGRAM! The ARTS Scholarships 2019 program provides talented, young artists with the opportunity to attend local, summer arts education programs that will broaden their experiences in a chosen artistic discipline. To qualify, students must be aged 11 - 14 by June 1, 2019 and reside in and attend school in Rhode Island. 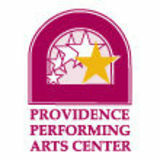 Applications are available at ppacri.org/outreach/arts-scholarship or in person at PPAC’s Administrative Office. Please send completed applications to Cynthia Goldsmith at 220 Weybosset Street, Providence, RI 02903 no later than Friday, March 1 at 3P. For more information, please call Cynthia at (401) 574-3105. On-sale dates for THE BAND’S VISIT and HAMILTON will be announced at a later time. 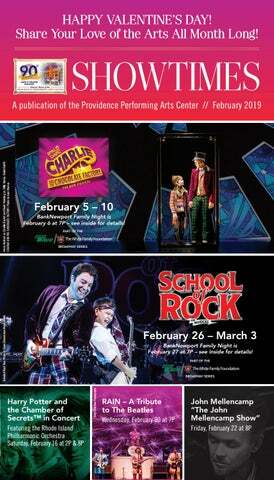 Come see *School of Rock Attleboro at the Warwick Mall February 20 from noon to 2P! You are invited to experience an “instrument petting zoo” and enjoy a concert by *School of Rock North Attleboro! This FREE and FUN event will take place in the Center Mall (past the food court). *Performers are not from the SCHOOL OF ROCK National Tour cast. All ticket prices include a $3 per ticket restoration charge and are subject to change without notice. Please visit ppacri.org for current prices. SHEN YUN returns to PPAC with a brand-new production. Watch ancient legends, heavenly realms, and modern tales of courage spring to life through classical Chinese dance. See ethnic dances, dazzling costumes, and powerful flips fill the stage with color and energy. And let the orchestra’s exquisite melodies, the singers’ soaring voices, and the dynamic animated backdrops uplift your spirit and transport you to another world. It’s five thousand years of civilization— reborn. The Harry Potter Film Series returns with HARRY POTTER AND THE CHAMBER OF SECRETS™ IN CONCERT, the second film in the Series. The Rhode Island Philharmonic Orchestra will perform John Williams’ Grammy nominated score, live, while the film is screened in high definition. In celebration of the anniversary of Abbey Road, RAIN brings the greatest hits of this epic recording to life, in addition to all your early Beatles favorites. This mind-blowing performance takes you back in time with the legendary foursome delivering a note-for-note theatrical event that is “the next best thing to seeing the Beatles” (Associated Press). JOHN MELLENCAMP’s career in music, spanning more than 35 years, has seen him transition from pop star to one of the most highlyrespected singer/songwriters in the music industry. His 24th album, Other People’s Stuff, recently topped Billboard’s Top Rock Albums Chart, a first in his career. Mellencamp is a member of the Rock and Rock Hall of Fame, the Songwriters Hall of Fame, a Grammy winner, and a recipient of the John Steinbeck Award and the Americana Music Association's Lifetime Achievement Award. LYLE LOVETT has broadened the definition of American music in a career that spans 14 albums over three decades. JOHN HIATT’s music is rooted in acoustic blues, accentuated by a soulful, gritty voice, which mirrors the gravity of his reflective lyrics. Together, Lyle Lovett and John Hiatt are two of the world’s most captivating and compelling musicians. Tickets: $62 - $42 Part theatre, part dance, part rock concert, and part construction site, TAP DOGS is crammed with high-energy dance, theatrical performance, and music performed by the cast and live musicians in this unstoppable spectacular. Whether in water, upside-down, or jumping through scaffolding, the Tap Dogs have been performing to the beat of their own drum for over 20 years. All ticket prices include a $4 per ticket facility fee and are subject to change without notice. Please visit thevetsri.com for current prices. Enhance your experience at The VETS with VIP Encore Lounge access – call the Box Office at (401) 421-ARTS (2787) or purchase online. Dana Brazil is PPAC’s new Director of Education. Dana comes to PPAC from the Dr. Phillips Center for the Performing Arts in Orlando, FL, where she served as Senior Director of Education since 2013. Dana received The Broadway League’s Outstanding Achievement in Education and Engagement Award in 2015 and also received an honorable mention for the 2016 Education Tony Award for her work in education and outreach. We are pleased to welcome Dana to PPAC and to Rhode Island! IN REMEMBRANCE… Elizabeth “Betty” (Conte) Laughlin We fondly remember Elizabeth “Betty” (Conte) Laughlin, who passed away in December 2018. Betty was an avid supporter of the Loew’s Theatre Building and of PPAC, and often attended productions and Galas with her daughter, current Board Director Cynthia “Cindy” Laughlin. Betty was also an enthusiastic participant in the PPAC/The VETS PRIDE Parade contingent over the last few years. Betty possessed an incomparable zest for life, and she will be greatly missed. Stephen M. Parisi We were saddened to learn that a longtime friend and colleague of the Theatre, Steve Parisi, passed away unexpectedly on New Year’s Day. Steve was the President of his family business, Brunca Waterproofing Corporation of Providence. Alan Chille, PPAC General Manager, said, "We have known Steve Parisi and Brunca Waterproofing since 1985. Steve's company initially did a stone restoration project on the façade of the Theatre. Over the years, Steve and Brunca continued to work with us on building restoration projects and became supporters of the Theatre. We have always appreciated his support, and will miss him very much."